Will I Hit the Maximum Social Security Benefit if I Wait to Claim? In short, no, you will not hit a maximum benefit limit as a result of waiting to claim your Social Security retirement benefit. The maximum benefit figure you see on the SSA website is not really a maximum benefit. Rather, it’s a maximum primary insurance amount. That is, it’s the maximum retirement benefit a person could receive if he/she claimed that benefit in 2012 at his/her full retirement age. If a person’s primary insurance amount was already at the maximum level, then she waited four years (from her full retirement age of 66 until age 70) to claim that benefit, the amount she would receive per month would be 32% greater than the $2,513 maximum benefit figure provided on the website. Why Is There a Maximum Primary Insurance Amount? The fact that there’s a maximum primary insurance amount isn’t the result of a separate rule specifically imposing a maximum. Rather, it’s a result of the fact that, each year, there’s a maximum amount of earnings that are subject to Social Security taxes (e.g., $110,100 for 2012). In other words, the $2,513 figure for 2012 is simply the primary insurance amount that you would have if you had earned (at least) the maximum amount subject to Social Security tax for the last 35 years. That would certainly suggest that it would be a good idea to liquidate some of your bond holdings in order to pay off the loan. But there are a few counterpoints that should be considered first. The line of credit’s after-tax interest rate is likely lower than 4% when you consider the value of any deduction you’re currently getting for the interest. In contrast, if your investments are completely tax-sheltered (i.e., not in taxable accounts), then there would be no need to reduce the interest rate on your bonds in a similar fashion for comparative purposes. In other words, the spread between the two interest rates may not be as high as it appears at first glance. In some cases, it makes sense to simultaneously borrow money at a higher rate than you’re earning on your lowest-earning holdings because doing so allows for greater liquidity, which offers a degree of protection against unexpected large expenses. A mutual fund portfolio well into the 6-figure range provides plenty of liquidity as well. Your cost basis in the investments (if they’re held in a taxable account). For instance, if the investments you would be liquidating are all in tax-deferred accounts, even if you do decide you want to go ahead and pay off the loan, it might make sense to do it over 2-3 years rather than all at once, because such a large distribution in one year from a tax-deferred account would likely bump you into a higher tax bracket, and the additional taxes paid (relative to spreading it out over 2-3 years) might outweigh the interest saved. What About Borrowing to Own Bonds and Stocks? Finally, some people would argue that the appropriate comparison is not the interest rate on your bond holdings as compared to the rate on the line of credit, but rather the average return on your total portfolio as compared to the rate on the line of credit — with the reasoning being that having the bond holdings is what allows you to have the stock holdings without exceeding your emotional/mental tolerance for volatility. Should I Own Any Sector Funds? With one exception (which we’ll discuss momentarily), I think few investors have compelling reasons to use sector funds. You have some information that the market doesn’t have (or doesn’t fully understand) about the industry or stock in question. For example, with regard to the first point, it would theoretically make sense for most investors to want to underweight the particularly industry that they work in. That is, it would make sense for most investors to have a smaller-than-average allocation to stocks in that industry. The benefit of doing so would be that it reduces the correlation between their job safety and their portfolio performance — thereby reducing the possibility of a particularly bad scenario in which their portfolio tanks at exactly the same time that they get laid off. In the real world, however, that strategy falls apart due to its impracticality. To create a portfolio that’s market-weighted aside from a smaller-than-average allocation to one industry, you’d have to craft a patchwork portfolio of funds representing each of the other industries. Doing so would result in a lot of extra hassle, additional room for error, and higher expenses (because most sector funds have markedly higher costs than “total market” funds). With regard to the second point, it’s a bit of a Catch 22. In the rare event that you really do have some information that the market doesn’t have or doesn’t fully understand, there’s a good chance that the reason you have that advantage is because of your work. For example, if you work in the healthcare industry, you might have reason to think that the market is underestimating the future growth of that industry. But the natural conclusion (i.e., to overweight healthcare stocks in your portfolio) is dangerous for exactly the reason discussed above — having your portfolio performance closely tied to your job safety is generally not a good thing. Rick Ferri argues that you would need a specific allocation to REITs if you wanted your portfolio to reflect the whole economy (rather than just the publicly traded portion), given that privately owned real estate is such a huge part of the economy. Personally, I would be happy with or without a specific REIT allocation. The book then explains that each spouse can thereby allow his/her own retirement benefit to continue growing until age 70, at which point they can ask to have payments unsuspended. Unfortunately, this strategy doesn’t work. And by trying to implement it, the couple could lose out on $60,000 of benefits that they could have collected between age 66 and 70 if just one spouse (ideally, Jack) had filed and suspended while the other spouse had filed a restricted application (for just spousal benefits) at full retirement age. The reason the strategy proposed above does not work is that you cannot collect a spousal benefit if you are “entitled” to a retirement benefit or disability benefit and your primary insurance amount is greater than 50% of your spouse’s primary insurance amount. To be “entitled” to a benefit in the way the Code of Federal Regulations uses the term, you must have filed for the benefit. And, after you have filed, even if you ask to have payments suspended, you are still “entitled” to that benefit (even though you will not be receiving the actual payments). So, in the book’s example of Jack and Jill, both spouses — having filed for their retirement benefits — would be entitled to a retirement benefit that is based on a PIA that’s greater than 50% of their spouse’s PIA. As a result, neither spouse would be eligible to receive a spousal benefit. In contrast, if you haven’t filed for your own retirement benefit (and you’ve reached your full retirement age), it’s possible to file a restricted application for just spousal benefits, while allowing your own benefit to grow. In other words, in the book’s example, if only one spouse had filed and suspended, the other spouse would be able to file a restricted application for just spousal benefits — thereby allowing both retirement benefits to grow until age 70 while one spouse receives a spousal benefit in the meantime. *I’m intentionally omitting the name of the course provider and the book. My goal is not to criticize but simply to make sure that people know not to try this strategy. How Far Does $300,000 of Retirement Savings Go? This week I came across a recent survey by Wells Fargo which found (among other things) that when middle class Americans were asked how much savings they would need in order to support themselves in retirement, the median reply was just $300,000. That’s a much lower savings target than you typically hear discussed in financial media. And the press release about the survey sure seemed to indicate that the figure wasn’t high enough. But just what kind of lifestyle can $300,000 of retirement savings support? I suspect it’s a higher standard of living than much of the financial services industry would have you believe. What Level of Income Could We Expect? With $300,000 in savings, if we assume a withdrawal rate of 4% per year, we get just $12,000 of annual spending. Fortunately, personal savings is not the sole source of income for most retirees. When we multiply the sum of those two monthly benefits by 12, we get a total of $22,140 in annual Social Security benefits. $22,140 of Social Security, plus $12,000 in spending from savings gives us $34,140 of annual income. 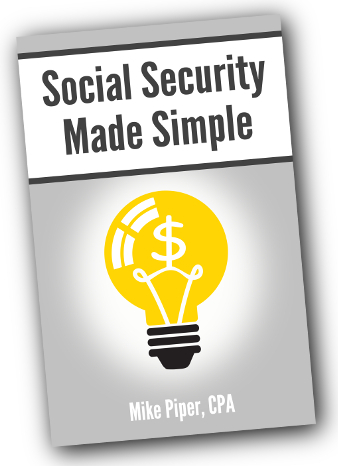 Unlike the wage income and self-employment income that most people earn throughout their working years, Social Security benefits and investment income are not subject to payroll taxes. In addition, at that income level, none of the Social Security benefits would be included as taxable income for federal income tax purposes. And the $12,000 of spending from savings — even if we assume it’s coming entirely from tax-deferred accounts — would be free of federal income tax as well because it would not exceed the standard deduction and personal exemptions. How Far Does $34,000 Go? Admittedly, given the high price of medical expenses and other day-to-day costs, $34,000 of income for a married couple doesn’t leave a lot of room in the budget for taking the family on cruises around the world — even if the $34,000 is tax-free. Many retirees (roughly 53% of U.S. citizens age 65 or older, as of 2009 ) own their homes and carry no mortgage debt. What to Do About Low Interest Rates? Should I move some of my money out of bonds and into stocks? Where can I find decent interest rates? Should I Move More into Stocks? Many investors are wondering whether, given the low yields on bonds, it makes sense to move some of their money from bonds to stocks. If you were already using an asset allocation that was in keeping with your risk tolerance, and your risk tolerance has not increased, then I don’t think it makes sense to shift further toward stocks. Reduce your withdrawal rate if you’re in the distribution stage. Where Can I Find Better Rates? For investors willing to do a little extra work, it is possible to earn better fixed income returns than what’s available via typical bond funds. For example, it’s easy to find FDIC-insured CDs with higher yields than Treasury bonds of the same duration, despite the fact that (assuming you stay within the FDIC limits) the two have the same level of credit risk. And as we’ve tangentially discussed in recent roundup articles, if you find a CD with a low early withdrawal penalty, it’s often advantageous to go ahead and pick a long maturity (and get the resultantly higher rate), because you will still have an easy way out in the event that a) you need the money, or b) rates rise and you want to reinvest the money at the new, higher rate. Banks sometimes use CDs as loss leaders to draw in new customers, with the hope of earning a profit from selling them other services.